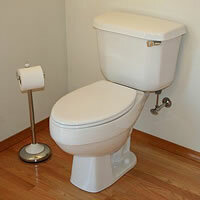 Toilet Repair/Replacement - The toilet is generally a study, durable item. However, over time, normal wear and tear can cause simple problems. Common toilet problems include: stopped up toilet, a constantly running toilet, a toilet that fills slowly, a toilet that doesn't flush completely, etc. These common toilet problems can require anything from a simple plunger or gasket repair to a complete rebuild or toilet replacement. Same Day Drains is qualified and experienced in rebuilding, replacing, and repairing any toilet problems you may be experiencing. Contact Same Day Drains today to schedule your in-home plumbing appointment with our plumbers serving Raleigh and other surrounding areas.